Well it’s another fun Saturday here and boy do I have a wonderful treat in store for you! Do you like chocolate? How about banana’s? Maybe some Peanut Butter? Well I like all of those things and what I like more is having them all together in a little muffin cup ready for me to eat! You’ll have to forgive the picture, I couldn’t control myself and I had to take a bite of this delicious, healthy little treat! 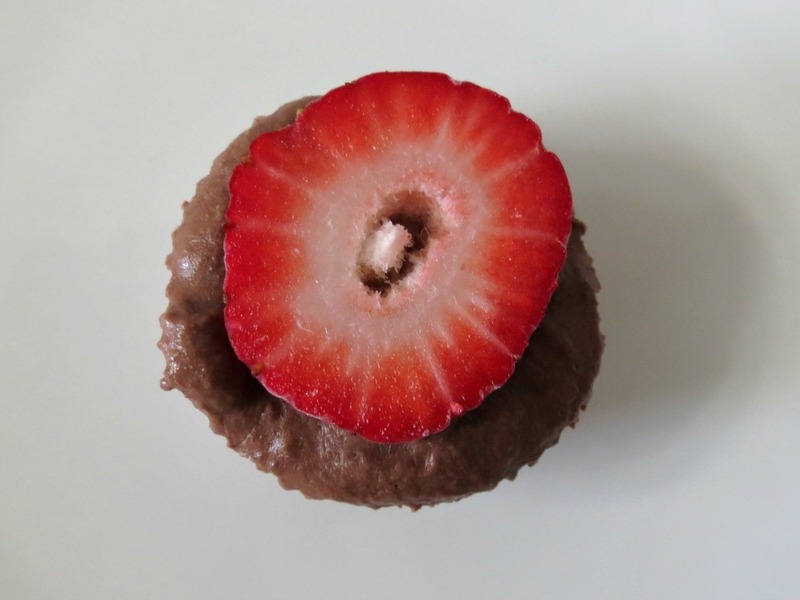 These little yogurt bites are made with a very ripe banana, greek yogurt, cocoa powder, vanilla extract, a pinch of coconut oil, peanut butter and I had to top it with a strawberry! This is one of my favorite combos. It’s kind of my smoothie / yogurt parfait snack that I like to have on a regular basis and I thought, hey want not freeze it and then I can just grab one when the urge hits!! Let me tell you, I grabbed more than one. Lucky they are guilt-free! These are super easy to make! All I did was add all my ingredients into my blender and process until creamy smooth! Then I scooped the batter and placed it into mini muffin cups! Top with my favorite berry, and in the freezer it goes! In an hour I had my frozen little chocolaty treats. Yum!! What’s nice about these bites is that when they freeze they don’t get rock solid. The fat from the coconut oil and peanut butter, plus the banana makes it nice and soft. Just be warned if you leave these on the counter to long they will get to soft!! Of course you can then just eat it with a spoon, but trust me, you won’t let them sit out that long. Once they were frozen, to save room in the freezer, I placed them into ziplock storage bags and placed back in the freezer. Then when I want my snack, I can just grab one. These are truly magnificent little bites! I gave one to Jenny and she loved them. I told her what was in it, and she was surprised! I love having a healthy snack on hand and these would not only be perfect for you, but they would be perfect for kids too! Beats all that frozen stuff they sell at the store! 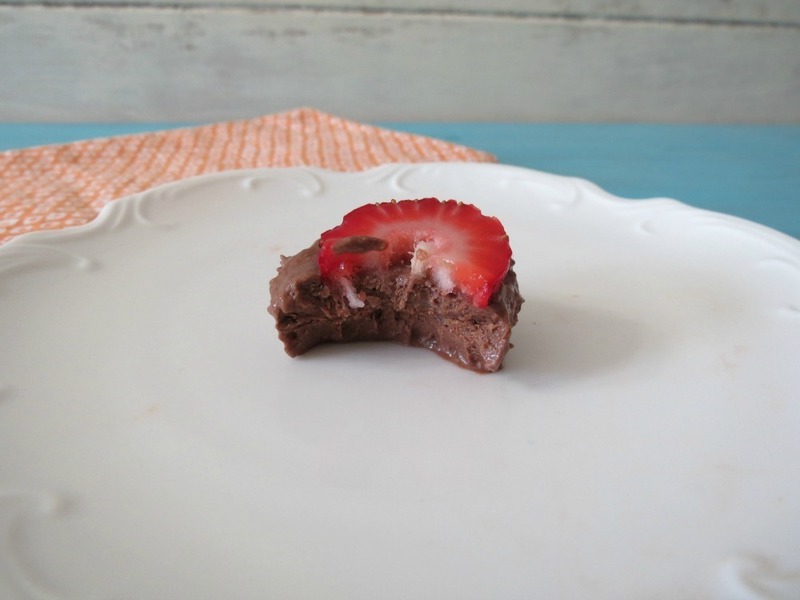 A healthy, chocolate, frozen, fudge like snack made with banana's, yogurt and peanut butter and topped with a strawberry. In a blender add all of your ingredients, except for the strawberries. Process until smooth, you may have to scrape down the sides of the blender. Add the banana batter into the mini muffin cups. With a small spoon smooth the tops of the batter. I also used a toothpick to swirl around to make sure there are no air bubbles. Top the banana batter with strawberry slices. 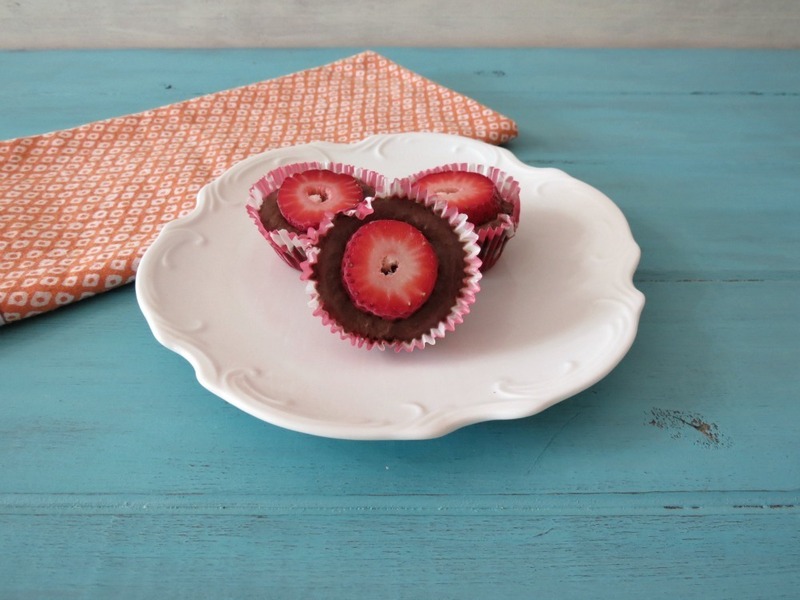 Place the muffin pan in the freezer and freeze for at least one hour. Then store in a freezer safe baggie. I am loving this combination and I will be most definitely be making these a lot in the summer!!! As I’m writing this, it got me thinking, remember Pudding Pops from the 80’s? They don’t make them anymore, but I remember the commercials with Bill Cosby. I loved those Pudding Pops, especially the vanilla and chocolate swirl. My Mom would buy them for us as a treat when we got good grades. Ahhh, the good old days, when Pudding Pops and a special trip to McDonalds is all us kids needed to be rewarded, and we were happy with that. Now a days it’s electronics! Talk about spoiled! Healthy Dining Finder – I thought this was pretty cool. You type in your zip code or the zipcode you will be in, and all the restaurants that have healthy meals on it, will show up. It will even give you the nutritional stats. I’m bookmarking this one for easy finding! Now no more, what can I eat at this restaurant? It’s all picked out for you. HUFF Post Healthy Living – 12 un-healthy foods that are fulling us. I was surprised to see vitamin water and McDonalds Oatmeal on the list. Shape Magazine – 20 of the coolest workout clubs in a America – Some of these clubs were pretty cool. I like to check out the pictures. It’s been kind of a slow week with links and things. Here is this weeks weekly recap. 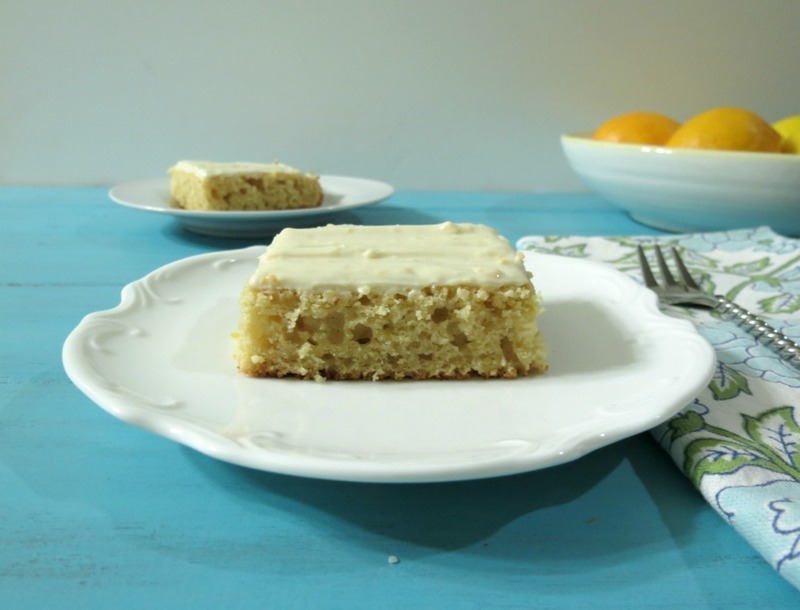 Sunday: Meyer Lemon Snack Cake with Lemon Cream Cheese Frosting #SundaySupper – I am disappointed in the photos of this cake, but don’t let that stop you from making it. It’s light, low-calorie and full of lemon. I really enjoyed this cake, and plan on making it again! 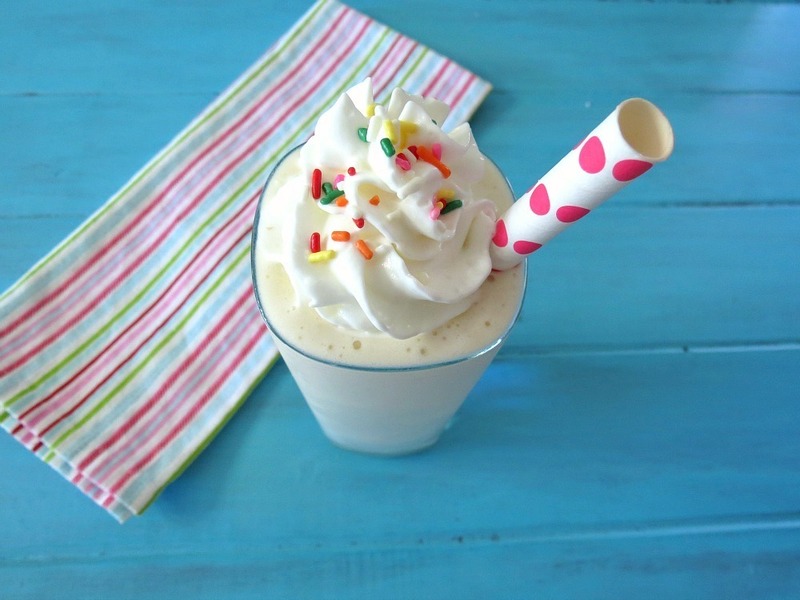 Monday: Banilla Breeze Smoothie – I love this smoothie, it reminds me of a milk shake, it’s thick, sweet and perfect for a hard workout! Tuesday: The Making of Bruschetta – One of my favorite combinations is tomatoes and basil! 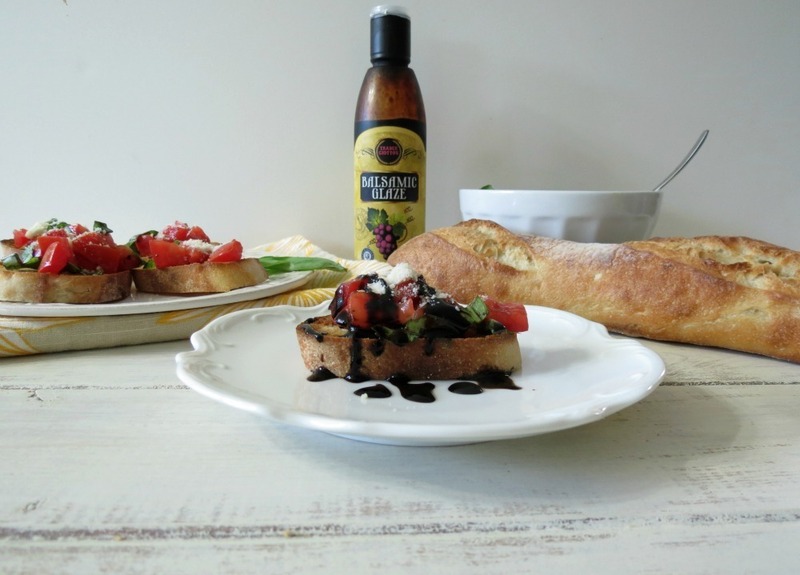 Bruschetta is one of those dishes that I could never get sick of. If you’re a frequent reader, you know how much I love this combination. I have made it in so many different kind of variations. Plus the balsamic glaze over the top, yum! Next time you go to Trader Joe’s you need to pick some up! 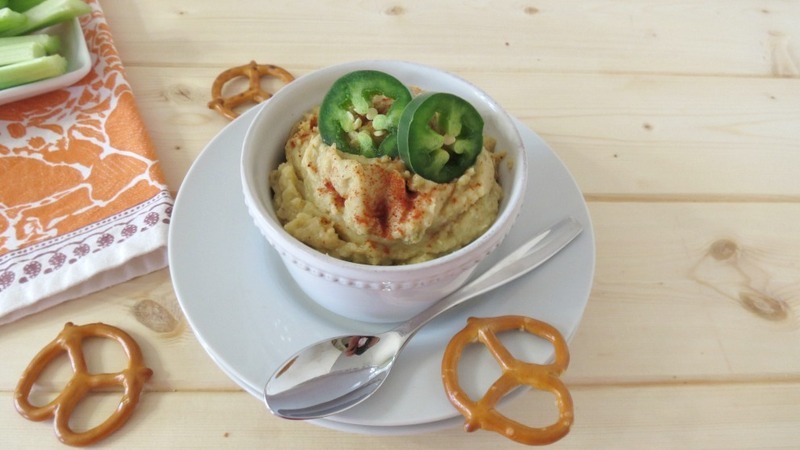 Wednesday: Jalapeno and Artichoke Hummus – I’m a total condiment freak! I swear I could live on dips and spreads! 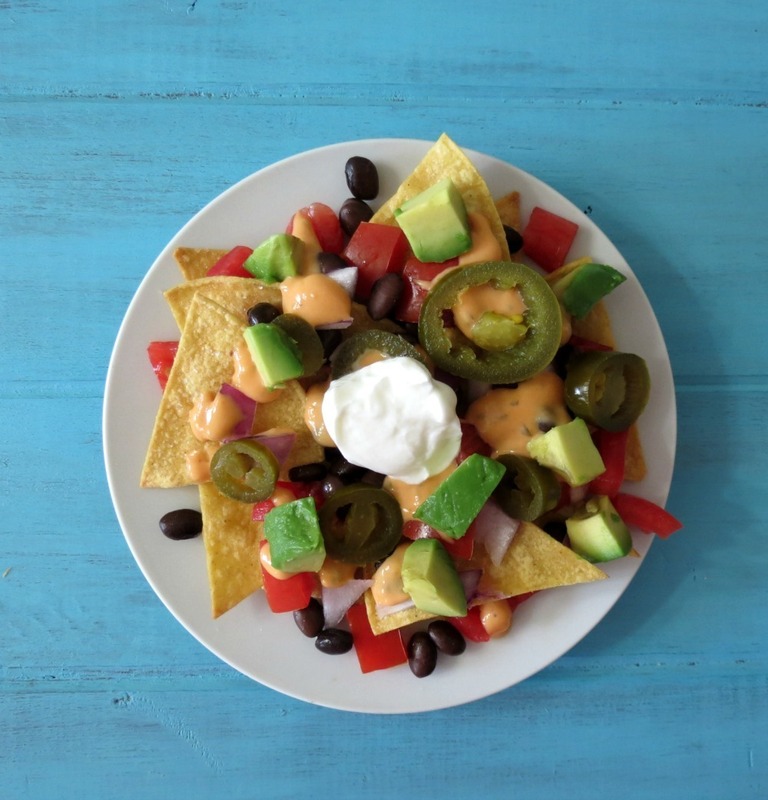 This hummus is for when I am craving nachos or jalapenos, which seems to be always! 🙂 it’s perfect for dipping pretzels and veggies in or even topping it on a nice sandwich! 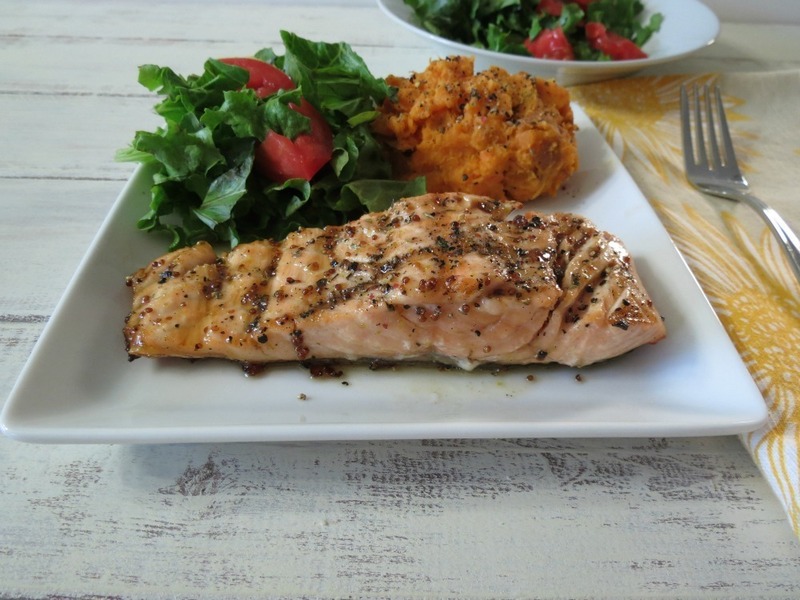 Thursday: Maple Mustard Glazed Grilled Salmon – This was the first time I ever made Salmon at home and it’s so easy and quick. I love the sweetness of the maple syrup over the top, which went perfect with my sweet potatoes. This week I had my trip to Monterey, and I must admit to you, I ate bad!! We had a ton of granola, trail mixes and desserts. I kind of went bonkers! It’s so hard trying to be good and apparently I did a very bad job at it. So this week, I am going to eat healthier and exercise until my legs fall off!! Along with all the fat I consumed!! Have a great weekend! 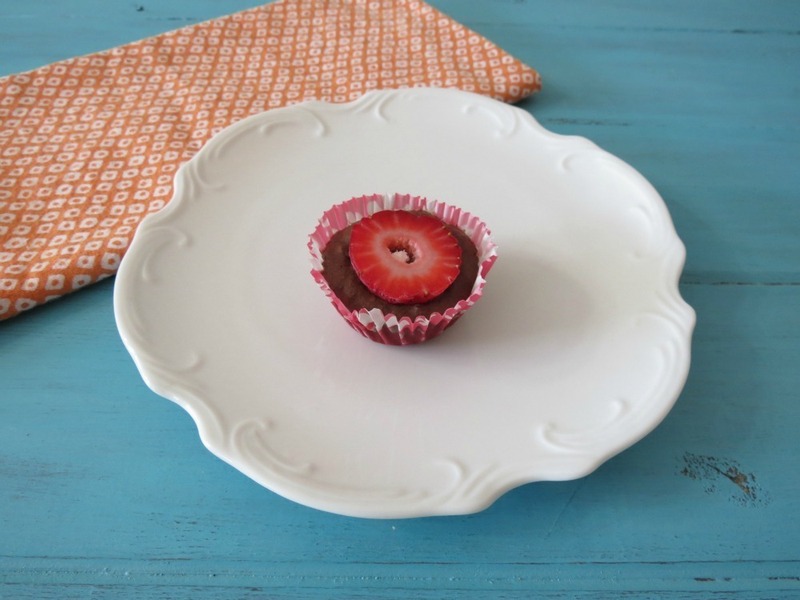 Oh and stay tuned for tomorrow, I have a low-calorie, budget friendly recipe for you! P.S. 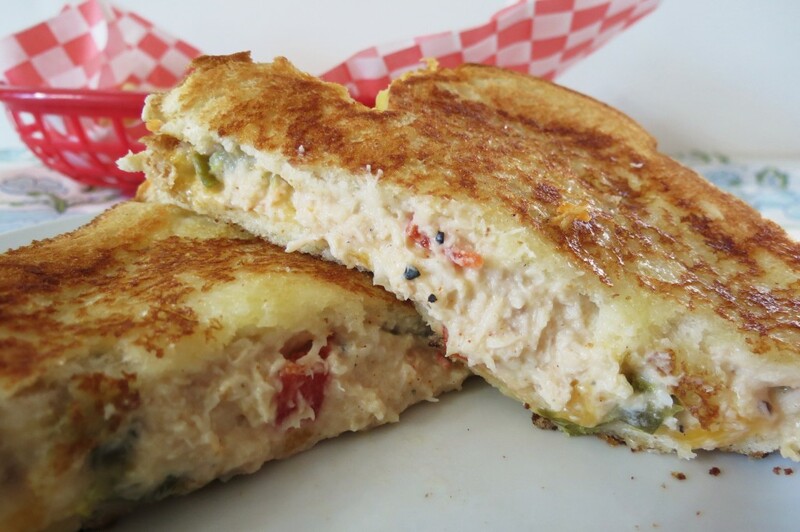 This weeks craving is dessert, but I’m going to skip it and have Crab Melt. Loving my seafood right now! 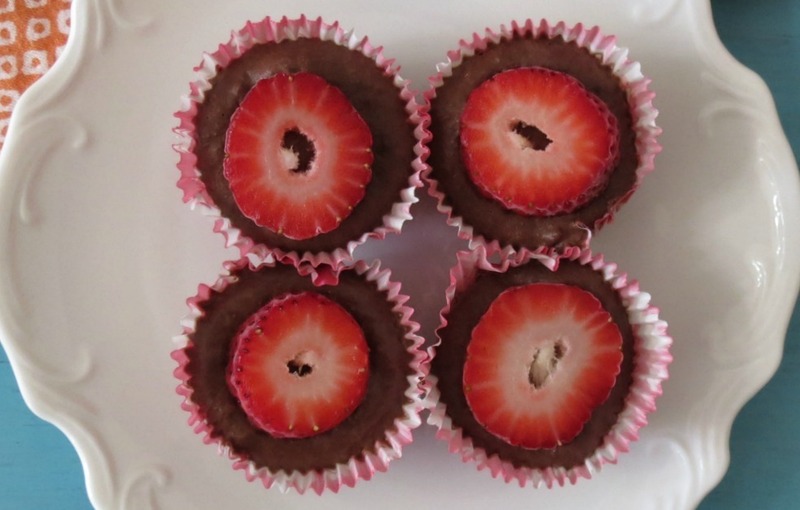 Love your chocolate banana treats, how creative and I think they’re very pretty too! You’ve had a delicious week, for sure! 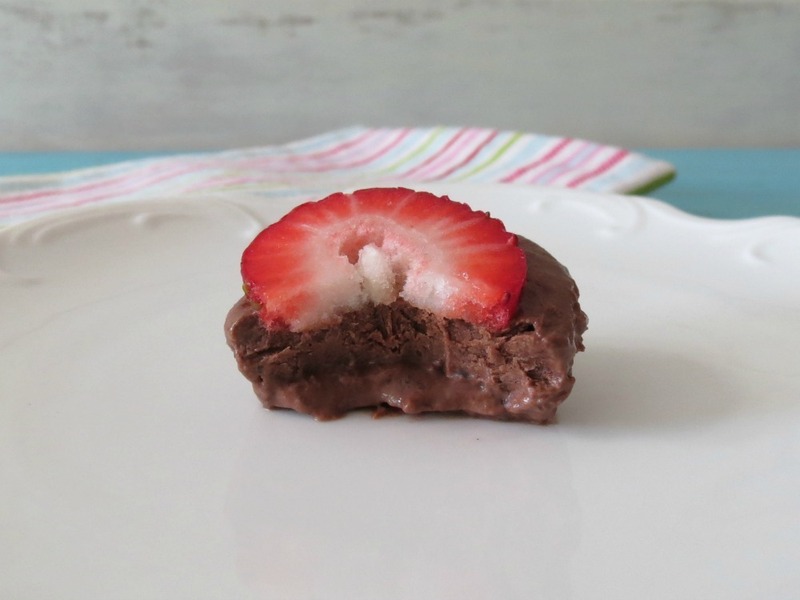 These will be great to have in my freezer! I am working on my waistline and living in hot Southern California, these will hit the spot when I am having an ice cream craving! Chocolate, bananas, and peanut butter! This is the perfect little treat! 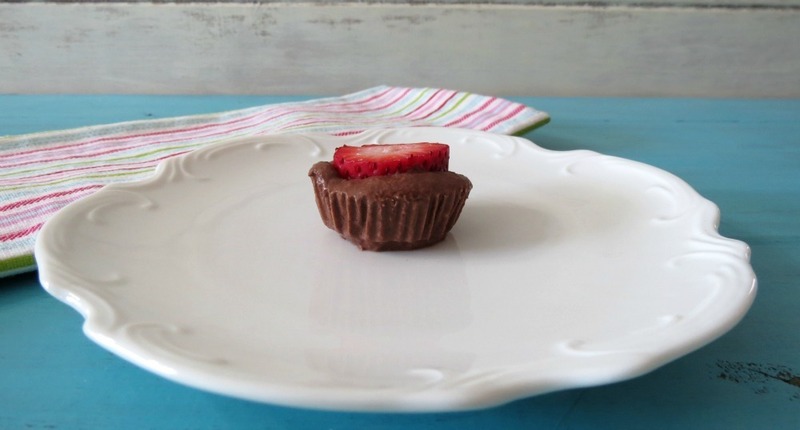 I have everything to make these little guys…guess I know what I’m having for dessert tonight!! And what a yummy week you had! Thanks Taylor! Let me know what you think of them. Thanks for reminding me about them, I have some in the freezer, think I’ll have one right now! I would skip the oil, with the banana and peanut butter the yogurt bite should still remain pretty soft. Let me know how it turns out! Hey! So I didn’t have any coconut oil in the house so I replaced it with canola oil. Is that ok? Thanks!! Hi Leslie! That should work, or you can even omit the oil all together, I think it maybe fine without it. Let me know how it turns out.